If not for a minor accident last week [more on that to come! ], I’d have been able to deliver my final thoughts on the Quangsheng Rebate Block Plane before now. For the time has come to pass it on to the next participant in the Workshop Heaven Passaround. Despite having a thumb that’s on the mend, I was able to knock up a simple raised and fielded panel, using a conveniently-sized scrap of brown oak, thicknessed down to 13mm. Now, I don’t wish for this to be a tutorial on forming a panel like this by hand; this is purely about how the plane performs. That’s a subject I may cover in more detail later on [there’s at least one project on the horizon…] and that kind of information can be found almost anywhere else on the internet. Holding a panel so small isn’t easy and I’m sure there are better methods for anyone wanting to emulate what I have done, here. Cutting across the grain first left no visible breakout whatsoever, which is not what you would necessarily expect with an open-grained timber (ash being another example). That’s why this piece of oak was ideal; kiln-dried and all. This plane really does have a nice weight to it – I’d go as far as to say it felt ‘perfect‘, in this situation. It also sits very comfortably in the palm of your hand. 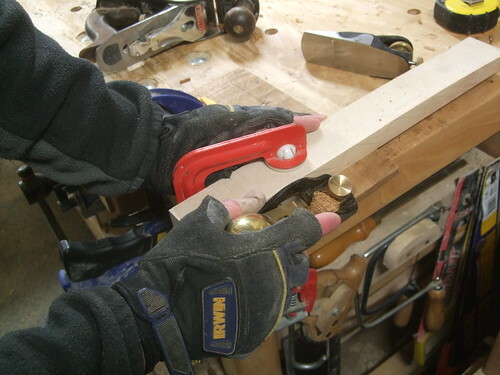 I feel that is what has helped to produce such a fine finish cutting across the grain, considering that the mouth on this particular style of block plane is not adjustable and quite wide open. Following the grain direction then, is always going to easy. Another reason I selected this particular scrap of oak from the pile was for the knots and “gnarlyness” down one edge… Yet again, this plane excelled and gave a finish far superior to what I would expect from a plane with a thinner blade. It was pretty much flawless and the shavings I was taking weren’t paper-thin! One major advantage in cutting panel edges like this with a rebate plane is that you can complete the width of cut in a single pass. Alternatively, I was taught to define the inner edges (around the raised portion) with a narrow shoulder plane and then complete the rest of the cut with a standard block or smoothing plane. If you do a lot of raised panel work by hand then, one of these planes is certainly worth considering! As far as British makers go, Phil Edwards [of Philly Planes] is the only name I’m aware of when it comes to panel raising planes. Always look at the mitres on a panel like this. 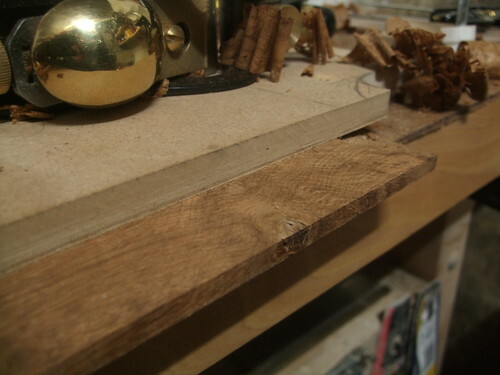 Next, I was thinking of rebating a length of ash, to see how that compares with a shoulder or traditional rebate plane. 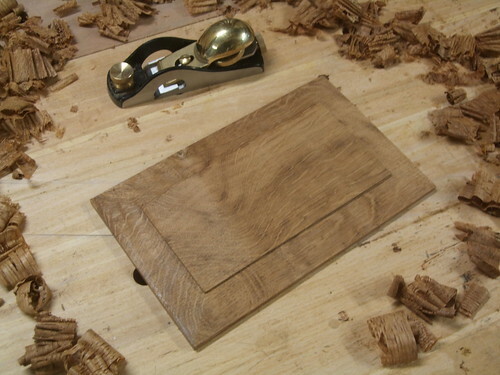 Seeing as I’d already cut with, across and against the grain on the oak raised panel though, I decided not to bother. I don’t see how this plane can be well suited to cutting narrow rebates anyway – anything less than half the width of the sole and its going to feel unbalanced. Getting the edge of the iron flush with the edge of the sole is critical although, I must admit I found this very awkward and barely achievable (it certainly wouldn’t ‘undercut’ a rebate, without a wider blade). On the bandsaw, I cut a rough tenon to demonstrate how effective these planes are at trimming tenon faces (there was little point in hand-cutting the joint). Again, the finish was superb and there was no trouble cutting across the grain of this rock-hard beech. 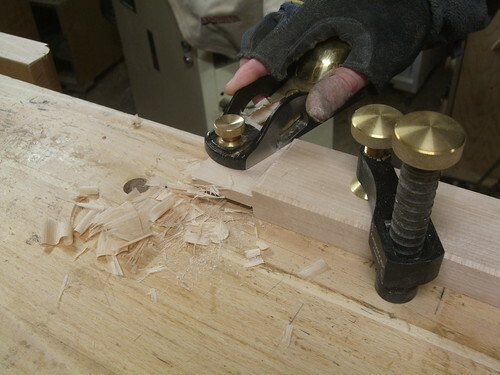 According to John Lloyd in his recent British Woodworking article on hand-cutting tenons, you can also use a plane like this (or a shoulder plane) to trim tenon shoulders. This is not something I decided to try as, again, I felt the plane would feel unbalanced on a shoulder only 8mm wide, which increases the risk of ‘over-cutting‘ shoulder and creating a visible gap in the assembled joint. Morally and ethically; is purchasing a plane produce in the Far East really any worse than buying one that’s made in North America??? My one outstanding reservation is to see [hear; from others who buy in to the Quangsheng range] how stable the castings are, several months down the line, even a year. That’s a problem you have if you decided to purchase a modern hand-plane at the bottom-end of the market – even a brand-new Stanley or Record/Irwin – the steel is rarely ‘seasoned’ properly before it’s machined – we’ve all had our problems with timber that’s not been dried or acclimatised properly. But, while many may advise you do purchase and do-up a vintage Stanley or Record at minimal cost, the Quangsheng plane was ready-to-use out of the box. I’ll certainly be keeping an eye out for others investing in their range of bench planes. Thanks for reading. I hope you’ve found this information useful.